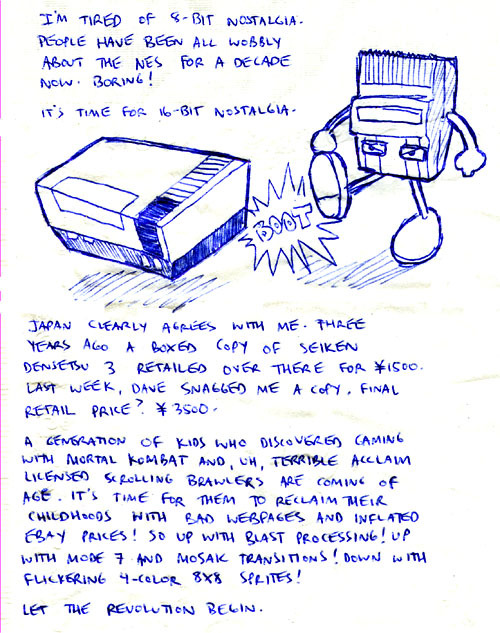 Given the way Super NES game prices have exploded on the aftermarket over the past year or two, I think it’s safe to say the rest of the world has finally caught up with this little napkin doodle. This entry was posted in Comic, Games and tagged archives, blog, Comic. Bookmark the permalink. It’s nice that once 16-bit nostalgia got big, there were plenty of download services to make it legal to play these games for a much lower price than it takes to be a collector. I was reading this and thought, “I’m pretty sure I picked up the copy of Seiken Densetsu 3 I own for mot much over retail price in Japan…” Buuuut, that was in (*looks up dates*), huh, 1996. I guess it doesn’t count as nostalgia when it’s only a year old.